You have arrived at another page with information on orchid care to help you along your orchid growing journey. This page will help you if you need information on orchid care that is more specific for various kinds of orchid genera. There are links on this page to pages for some of the more popular orchids. Caring for orchids is similar to other plants. Orchids need light, water, fertilizer and occasional re-potting. And I actually think it will help if you relate to your orchid plants by talking or singing to them. Like any living creature they appreciate being cared for and loved. I have arranged the information on the care of orchids by genus. There is also a link to the page to Ask A Question. Here you can get answers to your orchid questions from Melissa and from other visitors to this site. The real trick with orchids is to gain some experience and education and to be preventive with respect to problems. It really doesn't take much time or knowledge to keep them healthy. Want to learn more about how to care for orchids and get orchid tips from an Orchid Expert? Frequently people write me and ask me to recommend resources or sources of information to learn about orchids. Currently the one I am recommending first and my current favorite e-book is a little one I have recently completed. 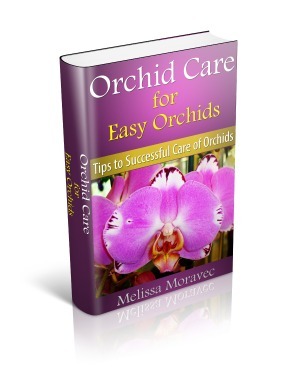 It is called Orchid Care for Easy Orchids Tips for Successful Care of Orchids. It is about 30 pages long and it is filled with a lot of great information on how to grow and bloom 5 kinds of "easy to grow" orchids. If you are interested contact me through the Orchid Contact Page. It is $4.99 and available in .pdf format or Kindle format, and payable through Paypal. I will be building a separate page for this little e-book and adding a Paypal button soon. I own about 20 hard orchid books and over 5 orchid e-books. I like different books for different reasons. But this is the one I would suggest as a good one to start with especially if you are new to growing orchids. If you are interested in specific orchids you can follow the links to pages on this site dealing with that particular kind of orchid. Cattleya are a beautiful plant with usually large blooms (except the mini's.) They are an relatively easy orchid. Dendrobiums are also very colorful and beautiful orchid. These orchids are not quite as common as the above but are beautiful in the waxy sheen. Do you have Oncidium orchid plants, here is how to keep them looking and growing well. What a nice example of a plant with spider-like petals. A look into the care orchids need in the Fall. Here is where to Ask A Question, a place to get your orchid growing questions answered by an expert.